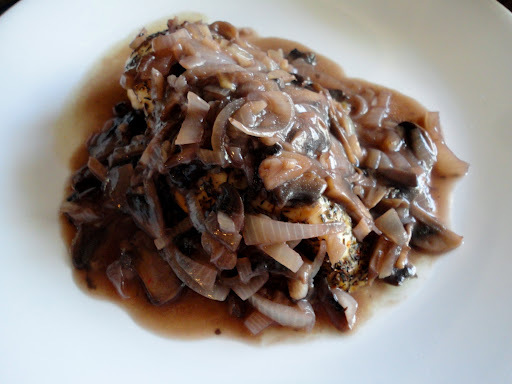 This picture doesn’t really do the meal justice as the chicken is almost completely covered by mushrooms and onions (oversight on my part). This this mea comes from Chef Michael Smith in his cookbook ‘Chef Michael Smith’s Kitchen’ – but you can also find the recipe here. 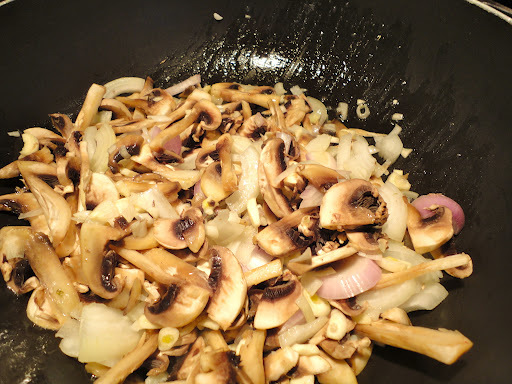 I’ve neglected writing some of the step – as this recipe has already been published. 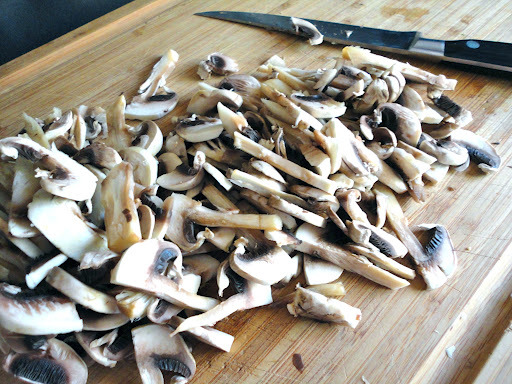 Testing out my knife skills, and cutting all those mushrooms. They seem like a lot – but get smaller once they’re cooked down. 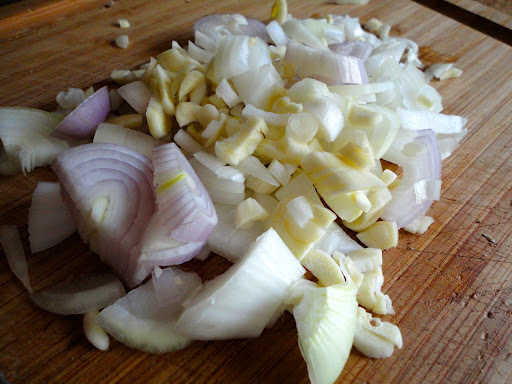 Usually I use my garlic press, but it hurts my hand – so I minced it. Next time, I’m going to use my microplane zester (which I have a love/hate relationship with). I sliced, chopped, and minced all the vegetables while I heated the oven at 450F. While the oven continued to heat up, I dressed the chicken (as evenly as I could). Unfortunately I didn’t take a picture of the vegetable mixture with the wine and chicken broth, but I did have a slight modification. I personally found that the sauce lacked flavour, so I added a few pinches of salt. During my culinary class, the chefs suggested that we add pinches of salt, stir, and then taste – eventually the salt will greatly enhance the flavour (but not taste salty). I’ve made this dish twice now, and found that these changes enhanced the dish. Do you have any good chicken recipes?